Our medium-sized gift basket - this price includes, shredded paper, cellophane wrap and ribbon. Suitable for up to 8 -12 items. We also have small and large baskets available. N.B. This is the price for the empty basket but is not for sale without a minimum of £15 of contents. 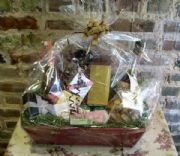 Please browse the shop and select items to put in your gift basket.